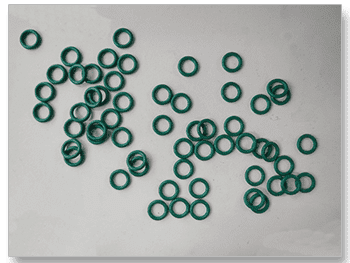 Feeding o-rings in vibratory bowl systems has been historically problematic due to buildup of static electricity causing the parts to stick together and stick to the bowl surface. 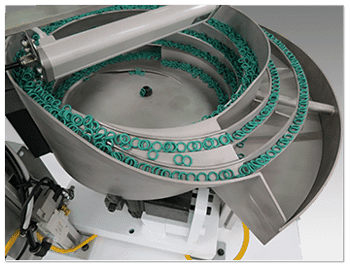 Coating the parts with talcum powder or baby powder has been a solution in the past, but isn’t acceptable in modern automatic assembly operations, which often feature parts with sensitive electronic components that can’t be contaminated with foreign materials. The clean and dry manufacturing environments these parts are assembled in make the static electricity problem worse. 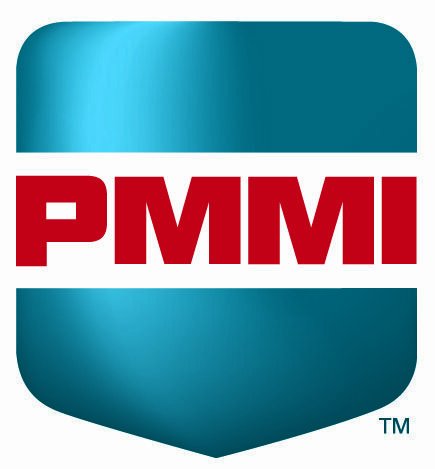 We solved this problem by integrating an ionizer into a vibratory parts feeding system. The ionizer (mounted over the bowl feeder) blew negatively-charged ions into the bowl, dissipating static electricity and ensuring reliable parts feeding performance. This vibratory bowl fed two lines of parts. Each line fed 30 parts per minute. 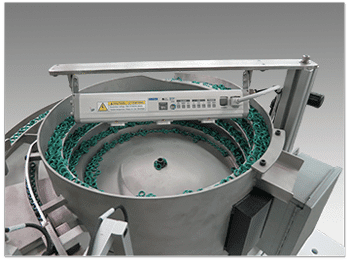 Multiple colors of parts were used in production, so the vibratory feeder included a purge gate to facilitate quick part changeover. 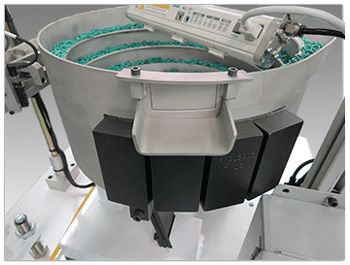 Two straight line tracks, powered by a single 2-spring vibratory inline driver, transferred the oriented parts between the vibratory bowl and the customer's assembly station. 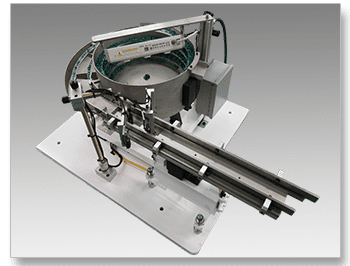 Photoelectric sensors monitored the level of parts in the straight line tracks, shutting off power to the vibratory bowl feeder when both tracks were full. 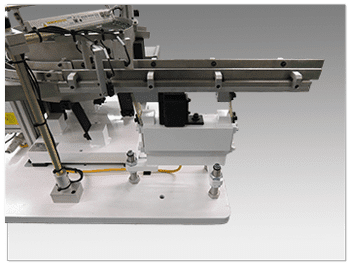 Feed rate: 30 parts per minute, per line (two lines of parts). Inside track length 24.50", outside track length 23". Controls: Reovib vibratory feeder controller. Blows negatively-charged ions into vibratory bowl feeder, dissipating static electricity. 24 volt DC power provided by Reovib controller. Mounting surface: 1.25″ thick steel plate with mounting holes, sized for future addition of sound enclosure. 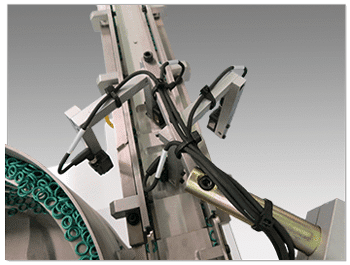 (2) 24 volt DC photoelectric sensors on straight line tracks monitoring the part level. When both lines are full, the bowl is turned off. Solenoid valve for ionizer air supply.